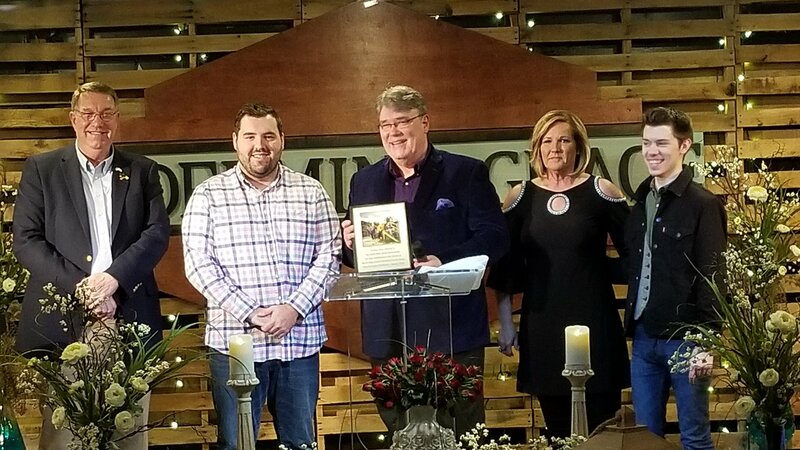 CULLMAN – On Jan 10, a special reception was held at Redeeming Grace Church of Cullman to celebrate Cullman’s own The Steeles, whose song “Prodigals” was named the no. 1 Southern Gospel Song of the Year for 2018 by The Singing News Magazine, The Printed Voice of Southern Gospel Music. Foregoing the typical “Nashville” gathering, The Steeles opted to have the ceremony (which honored those who helped with the award-winning song) in Cullman. The event was made even more special because Cullman Mayor Woody Jacobs presented all the plaques to each recipient that night.